Cinesamples: Cineperc. Still worth the money? Discussion in 'SAMPLE Talk' started by jononotbono, Feb 10, 2019. Man, if only that 40% off could also apply towards upgrades (I have core and pro), but my upgrade discount is still a little too expensive for me ($399 to complete the collection). sndmarks and benmrx like this. Same. FWIW Cineperc Core + Spitfire Joby percussion is a wonderful sound. That might be the next few days. It looks like up to 40% off. I wonder how to calculate this sale if I currently own Cineperc CORE - ONLY. I think they combined ALL the cineperc libraries sometime back. I'll have to check out the site. Yea a little confusing. I own CORE and my price for the COMPLETE set is $599 (with code they provide in my user area). YET I could buy the complete set today for $479 on this sale...……….hmmm. Code provided looks to NOT affect pricing at checkout???? Cineperc is the king of conventional/orchestral percussion. It's pricey though, so I would wait for a sale. Seems like Black Friday sales don't mean as much...there have been more sales that are just as good, or better after the holidays, than before. Haha! Yeah, speak of the devil and all that! I have the core library only and find it always does the job in whatever context or style I need it to. Glock, Xylo, Timps, Tamb... they always seem to sit nicely in the mix. stprodigy and jaketanner like this. 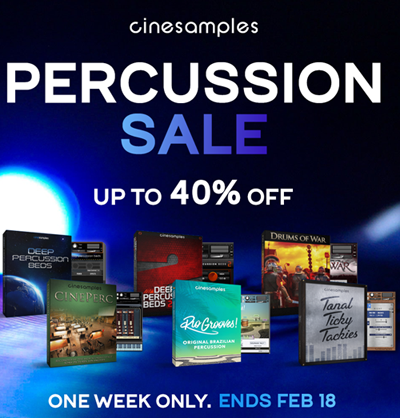 BTW, Spitfire has their percussion library also on sale for 40% off at the moment. Might be worth checking them out as well. I have both Cineperc and Spitfire Percussion, and I honestly use Cineperc 90% of the time, it just sits better with other libraries. I love the sound of Spitfire, and want to use them, but they are just a bit too wet for me. I also find Cinepercs aux instruments really useful, and a huge collection to boot! Cineperc is also way more expensive. I'm sure it's worth it, and I too would love to have it...even at my EDU discount it still come to $400 for the library. Wish they'd have a core version. You might want to contact them about this and ask if they can adjust this considering the sale. I've always found Cinesamples to be a great company w/ customer service as well as creating great products. It can't hurt to ask them about this. And just like that, there’s another library that I had no idea even existed until now, and that I’m absolutely SURE I need, but I can’t really say why, lol. Definitely my go-to percussion library for orchestral cinematic music. The Hollywood flavour and room ambience is unmatched, in my opinion. I got the 50% EDU off as well, so it's a no-brainer! Got to ask; you have Berlin Percussion right, Chris? How does CinePerc and Berlin stack up in your uses? Land of Missing Parts likes this. Where did you get the "core" percussion from? They only have the $799 bundle, then a bunch of secondary libraries, but I do not see a core.